Like to pop a Vitamin C pill when you feel a cold coming on or turn to bee pollen if hay fever is flaring up? And if you do, have you ever been told by someone that doing so is all a pile of rubbish and that your body doesn’t need supplements because you should get all your nutrition from your diet? Thought as much. 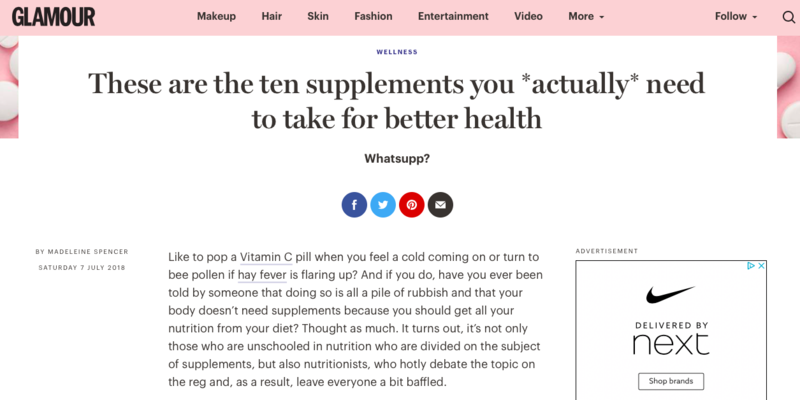 It turns out, it’s not only those who are unschooled in nutrition who are divided on the subject of supplements, but also nutritionists, who hotly debate the topic on the reg and, as a result, leave everyone a bit baffled. During the summer, you can get enough vitamin D from the sun, while it’s likely that you’ll eat more zinc-rich leafy greens in autumn. Whatever you can’t from your diet or lifestyle, supplement it in. Deficiencies aren’t, according to Marber, hugely common – but, if you suspect you might be lacking in something, book in for a blood test to find out what you need to be taking. Just as food that’s organic is higher quality and contains more nutrients, supplements that come from brands that source high quality ingredients will do the job better than those with low levels of vitamins and lots of filler ingredients. Start with a good quality multivitamin, always. Perretta claims that as they don’t work like medication, i.e. rather than by targeting just one thing, you’re likely to end up solving problems just by taking one daily. Vitamin C is a powerhouse and helps the immune system to remain robust, plays a part in the production of collagen, and reduces thread veins and rosacea. Perretta warns that sachets are likely to contain flavour so should be avoided. While we can make and store vitamin D, it’s unlikely that you’ll be exposed to enough sunlight to produce enough vitamin D if you live in the UK. Try taking them from September through to April to help with everything from cardiovascular health to strengthening bones to aiding fertility. Marber advises looking for D3 as it’s the most easily-used form in the human body, while if you’re vegan or vegetarian, find D2 or D3 that’s made from mushrooms. You’ll need to look for omegas 3,6,7 and 9 in a pill, advises Marber – though as you can get omega 9 from your diet, he’ll often supplement with omega 3 only. As you’ll need to take these long-term in all likelihood, he also suggests that you find some that you can afford to buy regularly. The key to finding a good ‘un here? Look for lots of strains of bacteria – and Marber adds that you must make sure it contains bacteria from both lactobacillus and bifidobacterium groups. You *may* not need zinc, as the recommended dose is 45mg daily and this may well come from your food or multivitamin, but if you’re low on it, you may find you have white dots on your fingernails as zinc plays a key role in replicating cells healthily. According to Perretta, 95% of women don’t get enough vitamin A in their diets – and, even if you do, you need zinc and iron to convert it. Your safest bet is to take a multivitamin and then some Vitamin A alongside it to help thicken skin, build elastin, and balance melanin. Start taking this pronto if you work out a lot – magnesium reduces inflammation and helps muscles to relax. As it has been proven to absorb well through the skin, thereby bypassing organs, you can apply this directly to yours in oil form. This is definitely one to take only if your doctor recommends it, but it’s well worth checking if you’re deficient if you have heavy periods as iron can help reduce pain and lighten them. Absolute pleasure – hope you find it helpful!